Ventura River Ecosystem: New Solution for Dam Removal? The Design Oversight Group meeting was well attended with representatives from local, state, and federal agencies as well as several local residents and interests. The primary topic of discussion was how to reduce the escalating costs of the project and re-energize the efforts to remove this obsolete dam. 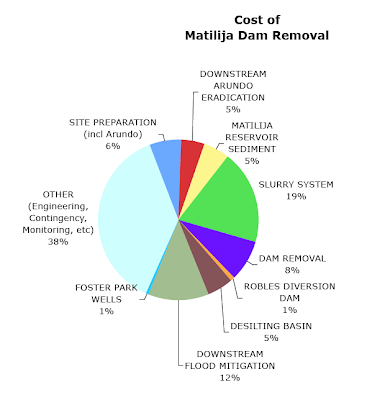 Project managers presented a new proposal that may provide a solution to the problem of managing the fine sediments trapped behind Matilija Dam. Note that apart from engineering and management, the slurry has always been the most costly part of the project. The addition of a thickener process increased the slurry costs from $20M to $30M - $50 million. This component has seen a proportionally greater increase, so the estimated cost of slurry disposal is approaching 25% of the total cost. After summarizing some of the issues with the two downstream disposal strategies (MODA and BRDA), project managers presented a new alternative for consideration. 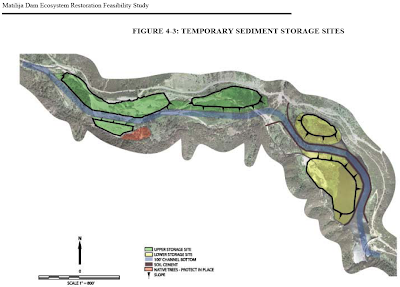 The "Upstream Storage" option would deposit the fines upstream of the dam within the storage sites previously identified within the reservoir area. Although the discussion focused mainly on permanent disposal of the fine sediments, design considerations for upstream sediment management should include incorporating the fine sediments into the overall sediment management strategy and the re-contouring/revegetation/stabilization of sediments upstream of the dam. Of primary concern is the downstream water diversion at Robles. Other concerns include passage and habitat for the endangered steelhead, sediment transport downstream to the beaches, as well as the long-term disposition of the property in Matilija canyon. Cost: If this approach is feasible it could potentially save more than 20% of project costs. Impacts: The footprint of the project remains within the reservoir area, eliminating the impacts from downstream sediment disposal, slurry lines, etc. An article in the Ojai Valley News titled "Solution Sought for Dam Removal" includes followup perspective from local project managers and the Casitas Water District. And Jenkin said this week that the behind-the-dam storage alternative could be workable, as long as the government does not insist that the silt be stored and capped in a way that does not jibe with the primary goal of removing the dam and returning the river valley to its natural state. But the county’s Pratt said that the new analysis will be looking only at permanently capping the silt with rock after it is spread on about 30 acres in the reservoir area. The analysis will not consider allowing the silt to erode because of possible dire consequences for the Casitas water agency, he said. The documentation for the recent removal of Marmot Dam shows that the river is now flowing clearer after dam removal than with the dam in place.